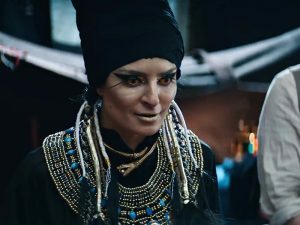 Beware of SPOILERS for Stargate Origins: Catherine in this interview! When MGM was ready to revive Stargate for a 10-part digital series, they needed a really good villain to pair up with our heroes. 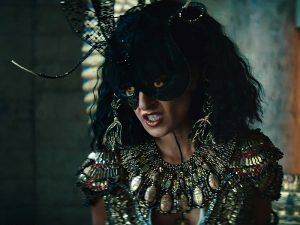 While the Nazi occulist Wilhelm Brücke (Aylam Orian) provided a bit of pure, mustache-twirling evil, the studio turned to Iranian-born actress Salome Azizi for the story’s more subtle and complicated antagonist: the alien queen Aset. 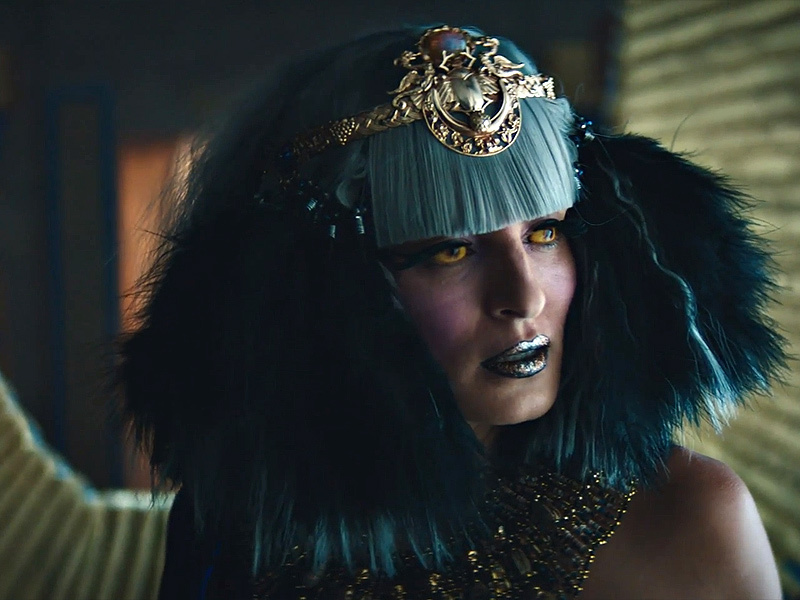 Salome graciously sat down with GateWorld to chat about Stargate Origins and her character. In our conversation she talks about being cast in the project, costume and make-up challenges, and feeling empowered by the Aset character. She also shares about learning the complicated ancient Egyptian dialogue, and the sorts of characters she hopes to play in the future. GateWorld’s interview with Salome Azizi runs a little over 27 minutes, and is available in audio format for your listening pleasure. Just click Play above, or subscribe to our special GateWorld Interviews podcast. The full interview is also transcribed below! Subscribe now to the GateWorld Interviews podcast wherever you get your podcasts to automatically get the very latest Stargate conversations from GateWorld! GateWorld: Hello and welcome! 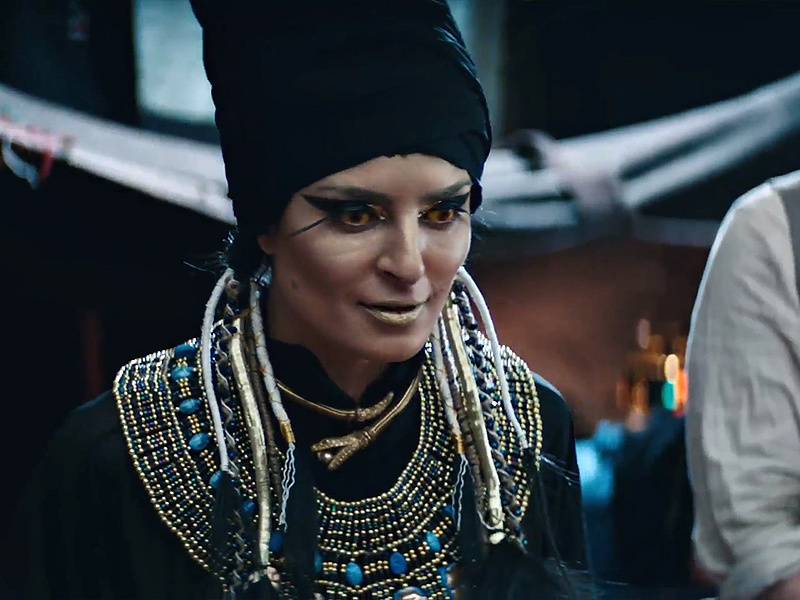 My name is Adam Barnard and on behalf of GateWorld.net I’m here with actress Salome Azizi, who plays Aset in Stargate Origins. Salome, thanks for joining us! 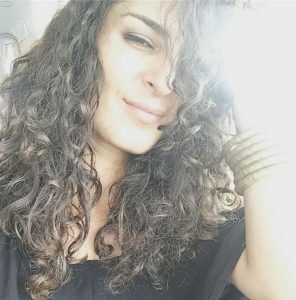 Salome Azizi: Thank you for having me, Adam! GW: It’s a pleasure. Your name almost sounds like something from Stargate — it’s an incredible name! What’s the root of that? Where does that come from? SA: Actually “Salome” is from the Bible. She was a princess. She was the one who fell in love with John the Baptist and then did the Dance of the Seven Veils to seduce her stepfather, in order to get John the Baptist beheaded because he wouldn’t kiss her. He wasn’t in love with her. She was quite a character. GW: I didn’t know that! I feel like I’ve failed my upbringing, because I grew up going to church every Sunday. So I should have recognized that, but I didn’t! So where are you from? SA: I was born in Iran. I’m from Iran. My mom — I think she read the story of Salome, or she read another book that has Salome as one of the main characters, and she fell in love with that name. And that’s where I got it from. But I’m originally from Iran. Then I grew up in London as a little girl. GW: That’s an English accent, correct? GW: When did you move from Iran to England? SA: I think I was probably about 5 or 6 — something like that. I can’t remember exactly what year it was. But I was really young. GW: OK. So you grew up in the English setting pretty early on. So that was the pronunciation of the words that you learned at that point. So I’m guessing at some point you came to the United States; can you tell us a bit about how you got into the film industry as an actress and how your journey — once you moved to England — led to that? SA: I always wanted to act. But I went to university and I got my law degree. It wasn’t something I was really committed to, but it was something I wanted to do. But I wanted to have a job that was stable! And so I got my law degree. But once I started practicing I realized that I enjoyed studying it, but it wasn’t something I wanted to commit my life to. So I kind of dabbled in other things. I got into journalism, production — all that stuff. And then when I moved to San Francisco, which is where I landed when I came to America, I started working for an advertising agency. And at that time I was married. And then my marriage kind of started to disintegrate, so I seized my opportunity to come to Los Angeles and pursue my lifelong passion of acting. So here I am! GW: How long ago did you move to L.A., then? Was it recently? SA: It was about four years ago — four and a half years ago. GW: And you’ve had quite a storied career since then. You have a pretty significant amount of credits for just being in the industry for four years. 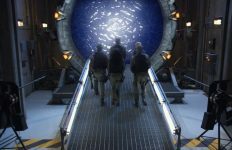 GW: Well Stargate is a very great place to be, to continue and elevate your career. The role is just incredible. I wanted to ask: being someone who has a Middle Eastern background, did you ever find you were getting typecast a lot? How does this role differ — or maybe it doesn’t differ — from the other roles you’ve gotten? Because I know like with Shvan Aladdin, who played Wasif, it was interesting because I heard his story that he was so excited to get this because so many times he’s been playing this “insurgent,” or this “terrorist.” You get cast in all the action shows and it’s unfortunate that so many talented actors get cast for one specific, myopic role. So how did the Stargate role of Aset tie into your career profile? Aset pays a visit to her adoring people — but Brücke’s actions cause things to go horribly wrong for the Abydonians. SA: Well actually let me just say something about that — being typecast. I know a lot of people don’t like being typecast, and they think it’s disappointing because they’re constantly getting “Terrorist #1” or whatever. But one of my acting coaches, Aaron Spicer, when I first started — he was saying that actually it’s a good thing. Because if you become typecast you do it so well, you become so amazing at it, that eventually people are like, “Oh! Let’s get the ‘terrorist’ or the ‘nurse,'” or whatever it is, and then they’ll immediately think of you because you can become so good at doing that. And then once you get your foot in then you can start expanding and exploring other characters. GW: You played a doctor on the network show Black-ish, right? You had a recurring role, right? SA: That’s right, yeah. And then I also played a director, which was another recurring role. And that was in Famous in Love. That was recent. I’ve played a journalist, like for N.C.I.S., and a mother for this movie that I did back in 2016 — American Fighter. Actually the second one is coming out either this summer or early next year. The first one was called American Wrestler; this one is called American Fighter. So I’ve been lucky enough to have quite varied characters to play. As Origins draws toward its climax Aset is enthroned, unaware that her plans are about to be upset. GW: So in regards to Stargate, when you went out for the audition — or just say even the day before you went out for the audition — did you know anything about the franchise? Had you heard of it? Had you perhaps been a fan of previous shows? SA: You know I’ve always been a fan of sci-fi, and I had watched Stargate many years ago, and I enjoyed it. I remembered it. But when I went out for the audition I didn’t know it was for Stargate at all. The way it was done I thought I was going for … they said it was a Web show, [a] Web series. So I was thinking it’s like a student project, or something like that. I didn’t even know it was Stargate — even up to the point where I got the script I still didn’t know it was Stargate. When I got cast I didn’t know it was Stargate. All I knew was the character, and it’s a Web show, and it’s going to go on for X amount of weeks. And I was really excited to be a part of it. But then once I started reading the script, I was like, “Stargate? !” I remember at some point I was like, “Oh, I think they’d better have the rights to this! Because Stargate was a movie, and I don’t know what they’re doing with it.” And then once it clicked I was like, “[Gasp] Oh my God! 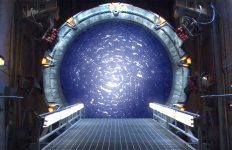 It’s Stargate!” So that was nice. GW: That’s so cool. Did you have to audition multiple times? Did you do any chemistry reads? Or is it just like you went straight from an audition tape or an audition to an offer? SA: No, I did a tape and then I went in for a callback. And that was it. I did a self-tape. And I remember for the self-tape I had to speak in ancient Egyptian, and they had the clip from the first Stargate. But because the ancient Egyptian was — the audio was manipulated, you couldn’t understand what he was saying anyway. Aset discovers that she has been betrayed by one close to her. GW: [Laughter] … because they have that “flanger,” “phaser” effect on the voice, right? So what I did was I just went online and found something online which was audible, and I just did that. I didn’t even do what they asked me to do; I just did something on my own. GW: So once you got cast in the role: it’s quite an opulent costume design and a setup. How long did it take you to get in the costume and make-up and incorporate that into your performance? SA: OK, so my bloody setup took forever! Because first of all I have to wear those lenses, right? And those lenses were like my nightmare. They were horrible. Because they were the size of my eyeballs. And I couldn’t do it myself, so somebody else had to put those things in my eyes. And then once they were in I couldn’t see anything. Everything was blurry; I had literally one sliver in the lens where you could see. But it wasn’t even in the center of my eyes. It was really difficult. And people had to walk me around because I couldn’t see what I was doing. And unfortunately I have to put those lenses in first, because my eyes were watering and crying so much. I had to get over that so it wouldn’t ruin the make-up. And then, of course, the make-up and the outfit and all that I loved. But I think it took me an hour, an hour and half, every day before I got ready to go on set. But you know the team was so amazing and so talented and so creative. Everything was amazing. They did such an amazing job. Seriously. It was like, hands-down amazing. GW: Yeah, because it’s not just like one element — like the eyes, or the hair. 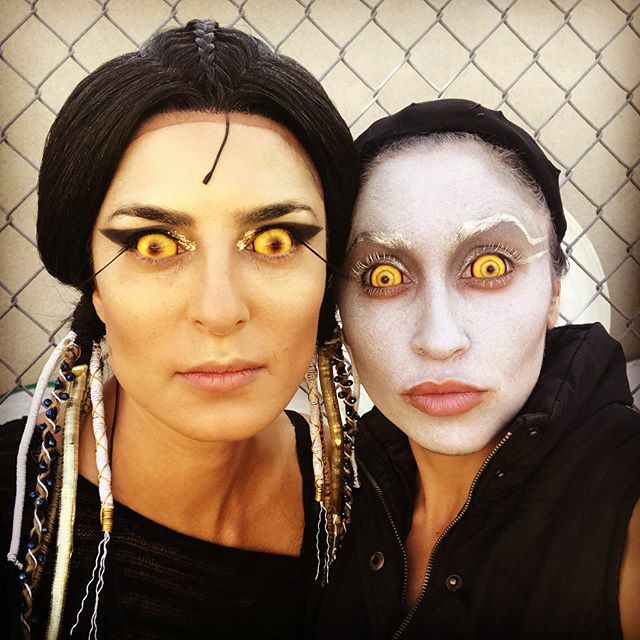 It’s hair, make-up, eyes … pretty wild costumes. It’s a whole ordeal. SA: It really is, yeah. It was amazing. But it’s great. GW: Did you get to contribute at all any ideas [to] the appearance of the character? Not [only] the performance choices — like with the hair or with the make-up design or costume or stuff like that? SA: No, I didn’t. But I think they had it spot on. I went to see Kit [Scarbo], who was in charge of the costumes, and she read me really well, I think. And I think she did that with all the characters. She just sort of looked at you, and then based on your look and who you are she sort of went on [and] created these amazing wardrobe pieces. So I didn’t feel the need to say anything. You know what I mean? They had it down. And then the make-up and the wig and all that stuff — everything they were spot on. I didn’t feel the need to make any adjustments or anything. You know what I mean? I think they had the character really pinned well.